There is nothing like camping in an RV. The home-away-from-home comfort mixed with the freedom to explore the outdoors makes it an experience unlike any other. At CURT, we know how much you look forward to those weekend camping trips, cross-country journeys and excursions down uncharted roads, and that is why we provide towing solutions that are totally dedicated to recreational vehicle towing. CURT RV hitches are a simple way to add more cargo space to your RV. RV hitches mount onto the back of your RV, bolting to the frame like our receiver hitches. They provide a 2” x 2” receiver tube opening to accept any hitch-mounted component with a 2” x 2” shank. CURT RV hitches are especially useful for towing along a cargo carrier or bike rack, and they can also be used for flat towing or dinghy towing a car behind your RV. CURT RV hitches come in two options – an adjustable frame-mounted style and a bumper-mounted style. The CURT adjustable tow bar offers a convenient way to bring an extra vehicle along on your RV getaways. The adjustable tow bar latches onto your vehicle’s bumper using a pair of bumper brackets and then couples to a ball mount on your RV trailer hitch. 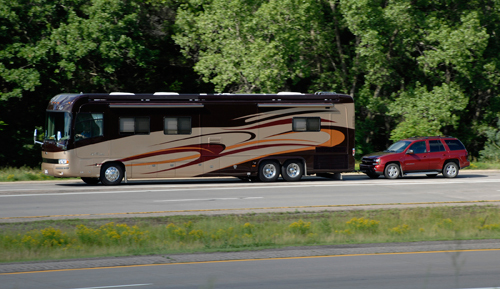 The vehicle can then be towed behind your RV, allowing you more freedom and mobility once you reach your destination. When towing a vehicle behind your RV, it is essential to have working towing lights just like if you were towing a trailer. CURT magnetic towing lights easily stick to your vehicle and connect to your RV to provide that added measure of safety.